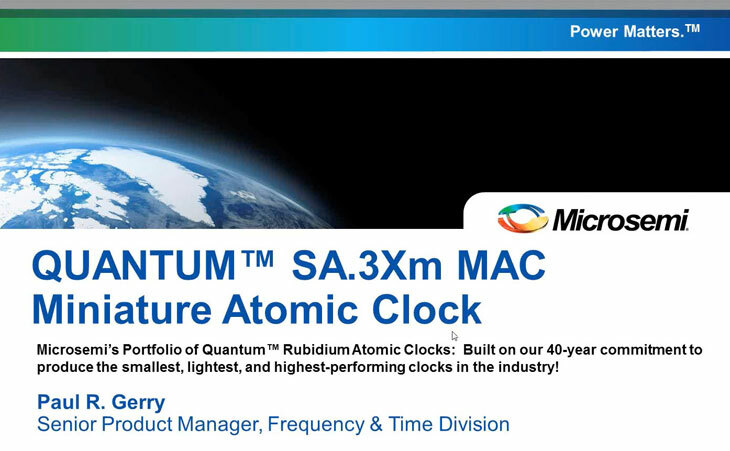 Cost effective, and easily adaptable to a wide variety of timing and synchronization applications, Microsemi's SA.3Xm is the world's first commercially available atomic clock. The SA.3Xm is designed for applications where an economical solution for frequency stability is required. Requiring little power, and able to operate across a wide spectrum of temperatures, the SA.3Xm is an ideal choice for wireless base stations, telecom networks, and test and measurement devices requiring the precision of a rubidium oscillator. Microsemi has designed the SA.3Xm for suitability in variety of timing and synchronization applications, including wireless base stations, telecom networks, and test and measurement devices. Microsemi has leveraged significant advances in physics miniaturization and integration to design a form factor measuring only 2 inch by 2 inch and standing less than an inch - five times smaller than existing rubidium oscillators. Low power consumption makes the SA.3Xm an ideal choice for applications where an economical solution for frequency stability is required. Wide spectrum temperature operation enables use in a range of applications. Includes standard quartz oscillator pinouts. The Microsemi MACdemo software (Part No. : 084-01513-000) provides a convenient graphical user interface for monitoring and controlling the MAC - SA.3Xm. MACdemo is also used for collecting and archiving monitor data from the MAC. It will install and run on any PC running Microsoft Windows XP or Microsoft Windows 7 and having at least one available RS232 (COM) port. Note: Multiple MACs can be monitored from a single PC, provided additional COM ports are available.